[New for 2012] There are a ton of great looking new products out this year, but I think one that seems to catch everyone's eye is the new Breyer's BLASTS! 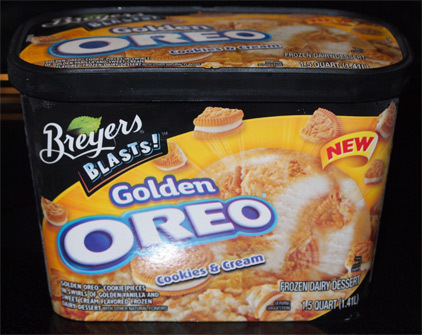 Golden Oreo frozen dairy dessert. I adore cookies and cream, it's one of my favorite flavors and it's usually hard to mess up. That said, besides mint cookies & cream, there aren't a lot of crazy variations on this tried and true flavor. Hey, even I'm pretty excited about this one despite it being a frozen dairy dessert. 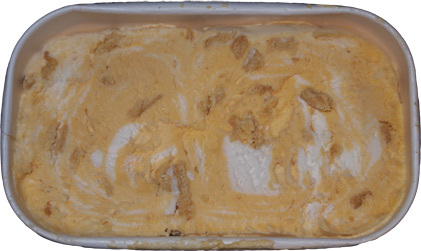 It's Golden Oreo Cookie Pieces and swirls of Golden Vanilla and Sweet Cream flavored frozen dairy dessert. The bright yellow packaging makes me fear that this one will be too sweet, and yet I feel I need to try this one right now! Well, that's pretty encouraging. We've got big Oreo cookie pieces all over the place, though I don't detect any small pieces scattered throughout. The bright white sweet cream swirls add a nice visual pop to the whole thing. It's kind of like the Oreo filling is scattered about (how cool would it be if it was filling? ahh, you're right, that would be sugar overload). I dig in and it's... well, it's something. It's definitely a soft dairy dessert, but not sure how the flavor is hitting me. Honest first impression? I don't know if I like it. It's striking me as an overly (almost fake) sweet flavor with an overtly soft texture that lacks enough cookie grit. On Second Scoop: So I head back with lowered expectations and the plan is to try to eat this treat alot slower. I want to really take my time and find that golden Oreo vibe that I'm looking for. While I adore original Oreos like the rest of you, I've always had a soft spot for vanilla sandwich cream cookies, so I really want to enjoy this flavor. I start off by aiming for the cookie pieces. Sometimes you need to get that cookie grit going so your mindset is in the right place. It seems to be helping and I'm focusing on letting the wafer flavor come through. Ok, it's growing on me. I still don't think there is that all encompassing cookie wafer flavor that you get in a top notch C&C product, but this ain't bad. It's different and I see alot of people giving this one a try. I just think it could be better. Verdict? It's not bad and the fat content is pretty low. The amount of frozen dessert (ice cream, etc.) varieties that you New Englanders have in your stores is amazing to me. You have stuff that I have NEVER seen in the stores here and I even check various store chains and locations! pretty sure it's not a blessing, it's a curse! This looks like it would be amazing..shame it wasnt as delicious as you hoped. I beg to disagree, sir! it has potential, it just needs tweaking! Thank you so much for reviewing this one! I've been wanting to try it but also thought it would be too sweet. It doesn't look as appealing as I would have hoped. I also hate how mushy the frozen dairy Bryer's are. I have tried this icecream several times and liked it alot more than I thought. I am a huge cookies and creme fan so I appreciate a twist on a classic original. I just got a new tub of Breyers Cookies and Cream ice cream and it tasted odd. Looking on the box it says "Frozen Dairy Dessert"! WTF? I swear the last tub I got said All Natural Ice Cream. Why did they change it? My thoughts exactly, though with two other flavors. :( The FDA says they can't call it ice cream because it no longer falls under the criteria for ice cream. They changed it for "quality control" purposes during shipping, stocking, etc., so now the grocers can let it sit out and refreeze it withiut the texture changing. I say it was also to cut costs and increase profits. oh yeah, that's right, they call it like "temperature change resistance" or something similar. I hadn't thought of it from quite that angle before, good call. It tasted odd to me, hadn't considered that it wasn't really ice cream now either. I love golden oreos but this concoction made me unhappy. Mom loved it though. Breyers blasts are not ice cream Unilever is trying to pull the wool over our eyes please do not purchase this fake ice cream. YESSSSS!!! This ice cream is the best I've never did any reviews on food items I just had to get on and brag about it! This ice cream is close to "Banana Pudding Ice Cream" which was from waay back then. Happy Brewers came up with something similar to it. Great! I've heard lots of complaining about Breyers Blasts being a "frozen dairy dessert". But I for one love Breyers Blasts. I actually prefer it's creamy smooth texture to the all natural ice cream that is Blue Bell which to me tastes milky and icy. My only complaint is that Breyers should put about 50% more Oreo pieces in it.